Needing a top-seven finish in Charlotte to take the world number one ranking from Luke Donald for the third time in the space of just nine weeks, the 23-year old world number two was at his brilliant best on moving day as he fired eight birdies and two bogeys to get to 12 under par. “I definitely feel like I’ve left a couple out there,” said McIlroy, who finished the day tied for fourth despite a disappointing three-putt bogey at the 16th and a missed chance from 14 feet at the last. Simpson birdied the 17th to break out of a three way tie for the lead, carding a 69 to top the leaderboard by a shot from Ryan Moore (68) and DA Points (69) on 14 under. McIlroy is tied for fourth with halfway leader Nick Watney (72) while Rickie Fowler (67) and Stewart Cink (71) are only three off Simpson’s pace on 11 under. All the leaders, however, will be watching for McIlroy’s name today as he takes on one of his favourite courses. 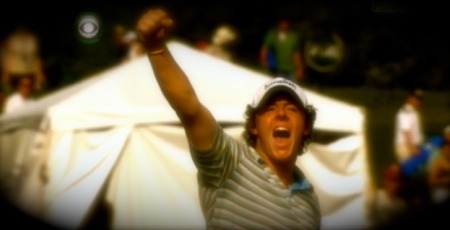 In 2010 he made the cut on the number to go into the weekend nine strokes off the lead and responded by playing the remaining 36 holes in 16 under par, closing with a scintillating 62 that made him the youngest winner on the US Tour since Tiger Woods in 1996. Woods is not around to stop him winning his fourth PGA Tour title this time having missed the halfway cut. And the shift in the balance of power at the top of the game was brilliantly illustrated by reigning US Open champion McIlroy yesterday as showed that he has all but solved swing problems that dogged him at the Masters. “I think I was nine back or ten back going into the weekend here last time, so being only six back should be easy,” McIlroy joked after his second round 68 on his 23rd birthday left him six behind leader Watney. McIlroy hits his approach to the 14th in Saturday’s third round. Perhaps he wasn’t joking after all. He got off to a dream start when he birdied the three of his first four holes, holing a nine footer at the first, a 40 footer at the second and a three and a half footer at the third to get to within three of the lead. “I think the work I did on the range yesterday paid off a little bit,” he said of his improved long game. ” I think when you get off to a good start like that, you get a bit of momentum early and you keep going with it. “I went out today with not many expectations. I just wanted to go out and play well and try and improve on my ball striking. That will be the goal again tomorrow, to try and go out and play better and hit some better shots than today. A delicious long bunker shot to two feet set up another birdie at the par-five fifth but while he stuttered briefly, fluffing a chip to bogey the 250-yard sixth before failing to birdie the par-five seventh, he was soon back in full stride. After a birdie from eight feet at the eighth and a par at the tough ninth saw him turn in 32, he then birdied the par-five 10th from five feet and the 11th from 10 feet to go six under for the day and get to within a shot of new leader DA Points on 12 under par. Watney played the front nine in level par to remain alongside McIlroy and Rickie Fowler, Webb Simpson 12 under a par as Australian John Senden joined Points at the top of the leaderboard early on the back nine. After chipping and putting from just right of the par-five 15th for his eighth birdie of the day to move into a share of the lead, McIlroy entered the closing stretch known as the Green Mile and showed no signs of defensiveness. This time it cost him. After unleashing a 362-yard drive at the 16th that left him just a wedge to the green, he faced a 15 footer for birdie but ran it too aggressively at the hole, lipped out and missed the four footer back for par. After negotiating the par three 17th in regulation with a tough two-putt from 45 feet, he carved his drive into the crowd at the last but hit a sensational approach that finished 14 feet below the hole. Phil Mickelson and world number three Lee Westwood failed to mount a Saturday charge, however, carding four under par 68’s in each other’s company to go into the final round seven adrift of McIlroy on five under. But with the top 14 players covered by just six shots, it promises to be a final round cavalry charge for a top prize of $1.17 million. He may need help from the leaders but Rory McIlroy gave himself a fighting chance of challenging for victory in the Wells Fargo Championship when he fired eight birdies in a stunning seven under 65 at Quail Hollow. 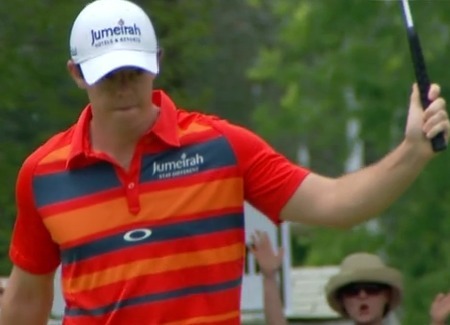 Rory McIlroy lips out with his birde putt from two feet seven inches at the third. It was the first of numerous misses from short range. Picture: Eoin Clarke www.golffile.ieFor a while it looked like being the 24th birthday from hell. Then Phil “The Thrill” Mickelson and Nick Watney committed a series of blunders that threw the Wells Fargo Championship wide open and left Rory McIlroy - despite a horrific day on Quail Hollow’s poor greens - just three shots off the pace. Keegan Bradley for Irish Open?